This innovative approach to product development can speed time to market and improve the return on investment of mission-critical R&D programs. To improve the return on their R&D investments, high-tech companies need to bring together their processes and tools for managing both software and hardware development. Unified Application Lifecycle Management-Product Lifecycle Management (ALM-PLM) takes the best from existing hardware and software management and integrates them into a powerful set of processes and tools to maximize R&D efficiency and effectiveness. For large high-tech companies, R&D investments can represent as much of 30 percent of revenues annually—a billion dollars or more spent managing products through their lifecycle. That means that R&D effectiveness and efficiency has a major influence on overall business performance. Business risks are high when that efficiency suffers: Accenture research has found that late product launches can cost a high-tech firm 10 percent of its profits over multiple years. Managing product development is more challenging today given that differentiating products include innovations in both hardware and software. Today’s smartphones, for example, appeal to consumers as much for their applications as for the capabilities of the physical device itself. The relatively seamless integration of software and hardware in Apple products has been a significant factor in the company’s tremendous success. Thus, a key to improving high-tech companies’ return on their R&D investments, including the achievement of time-to-market goals, is coordinating the joint development of hardware and software and the subsequent integration into a fully functioning product. That is a challenging goal, given that the majority of high-tech companies still use separate and non-integrated processes to coordinate product development—Product Lifecycle Management (PLM) tools for hardware and Application Lifecycle Management (ALM) tools for software. This non-integrated approach adds costs and risks to product development. For example, the reconciliation of data across disciplines for a complete product (such as requirements, test cases, defects and change orders) becomes a manual process. That means the process becomes difficult to track, often resulting in errors that can lead to a delay in overall product development and release. An important means of enabling integrated management processes for hardware and software development is what Accenture calls a “Unified” Application Lifecycle Management-Product Lifecycle Management (ALM-PLM) framework. Unified ALM-PLM can improve time to market for new products, support better communications across the product team and, in general, improve the efficiency of R&D, thus increasing return on investment. Unified ALM-PLM brings together the strengths of Application Lifecycle Management tools—such as managing requirements and features, as well as managing test cases, test results, defects and code—and integrates them with the strengths of Product Lifecycle Management tools, which include capabilities such as managing the bill of materials, product changes, product configurations and product compliance. A common data model. Unified ALM-PLM defines a common data model and change management processes for managing an entire system—both hardware and software data—without duplicating data management or business processes across those systems. The two primary integration points are (1) tying the requirements back into the bill of material between software and hardware, and (2) tying defects and issues back together with change requests and change orders so that they can be reflected in PLM. The management of both hardware and software requirements. Unified ALM-PLM enables tracking and managing the complete, integrated hardware and software product requirements from the original product concept through design and then into testing and validation. An integrated bill of materials. The process ensures compatibility of an entire product through an integrated product bill of materials within PLM, combining both hardware and software components. Consistent defect and change management. A single process for product defect management and change management across hardware and software enables better tracking and management at the product level. A framework that is independent of any particular tool or platform. The framework of Unified ALM-PLM can be implemented on many kinds of systems from different vendors because the standard data model and processes can be adapted to fit multiple technology environments. By not being tool-dependent, the solution framework can be used more readily by companies with different systems environments. 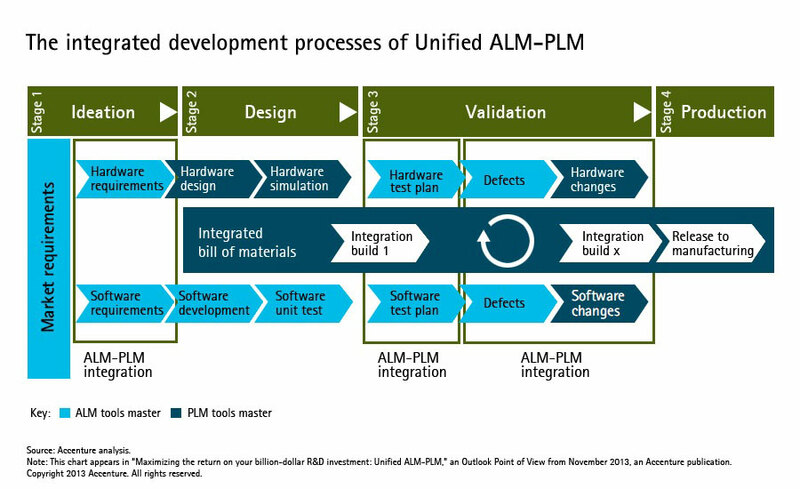 How does Unified ALM-PLM work in practice? As shown in the accompanying figure, steps that are unique to either hardware or software development can proceed independently. However, integration is supported at certain critical points in the process—during the requirements phase, for example. Also, as hardware and software start to come together into a product, it is important to coordinate the process using an integrated bill of materials that captures relevant information needed on both the hardware and software sides of the house. Unified ALM-PLM delivers several important benefits to high-tech companies. Increase revenues by staying closer to the customer. Unified ALM-PLM can help development teams quickly react to changing market needs by capturing and managing new and changing requirements, and by monitoring customer feedback. The framework can also integrate with agile development processes where requirements are extremely dynamic but still must be managed at a complete product level. Cut costs by improving the efficiency of R&D. Better management of cross-functional requirements can limit the number of last-minute changes and “fire drills” when launching a product, reducing waste and delays during development. Improve development times by enhancing team collaboration. A related benefit of the integrated approach is that it gives people on development teams the ability to explain the impact of a requirement or design change to everyone across the entire cross-functional product team, ensuring that all teams affected understand and acknowledge the change. Increase ROI by improving the management of defects and enhancements. Other benefits accrue when it comes to defects management and enhancements management. Defects have generally been well tracked in the software world. Test cases for software will track defects which are then fixed later in development. On the hardware side, defect management has not been quite as mature, so enhancing those capabilities using ALM processes can ensure compatibility of releases between software and hardware, and provide consistent status tracking to support better planning for the product. This is another way that Unified ALM-PLM improves companies’ return on their R&D investment and ultimately the product quality. In the hyper-competitive high-tech marketplace, improving the effectiveness of R&D and speeding new-product launch cycle times are critical to success. Executives of high-tech companies are increasingly looking at their R&D spend—up to 30 percent of their revenues—and asking what they’re getting for that investment. To maximize ROI, the processes and tools for managing the product lifecycle and the application lifecycle need to be brought together in an integrated way. Unified ALM-PLM takes the best from existing hardware and software management and integrates them into a powerful set of processes and tools to maximize R&D efficiency and effectiveness. Kevin Prendeville is a managing director and the lead for Accenture Product Lifecycle Services. Jeff Pitcock is a senior manager in the Accenture Innovation & Product Development group.